I’ve been a middle blocker my entire volleyball career. I tried other positions – I definitely think it’s helpful to experience a different role – but I always went back to playing middle. It wasn’t because that’s where I was placed when I first started playing at age 13. And it also wasn’t because I didn’t want to move out of my comfort zone and do something else. It was because I genuinely felt like I understood what it meant to be a middle blocker and how my role was designed to help my team. It’s one of the more physically demanding positions. It’s not very glamourous. Middles typically get fewer sets and, for young teams, blocking is usually an afterthought. 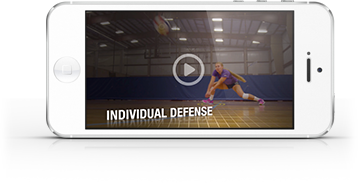 But if players can be taught what the goal of a middle blocker is, they’ll be much more successful doing their job – even on plays when they don’t touch the ball. This is by far the most important quality in a middle blocker. One of my early (and best) coaches explained to me that a middle’s job on offense is to pull the opponent’s blockers away from your pin hitters, and this was achieved by calling for a set early and loudly. When I was young, I didn’t get many sets, but I stuck to my coach’s instruction. As I got older, I realized how tremendously I was helping my team, even if I wasn’t scoring the point myself. Additionally, my job as a middle became to call out the opponent’s hitters and setter before every serve. Not only was this relaying important information to my team, but it was also intimidating for the other side. Young players may find it embarrassing at first, but in my experience, no one is laughing at you when you’re winning. Plus, players who have no problem communicating become valuable resources as the competition gets tougher. Being a middle is about having a presence on the court. Calling out the other team’s hitters and pulling their blockers is certainly part of that, but for it to be truly effective it requires a certain level of purpose and confidence. Of course, confidence is key to any position in volleyball (and life), but as a middle blocker, you are the first line of defense for your team. You have to take ownership of the net and decide that you will do everything in your power to stop the ball from coming over. The pin blockers have some responsibility at the net, but it primarily belongs to you. Take ownership of it. Play the tight balls, be dominant in your blocking and don’t hesitate. Being a good middle blocker is all in your mentality. The sets aren’t always going to be perfect, and you have to figure out what to do with them, quickly. There will be times when you misread a setter and then have to work twice as hard to get into the right blocking position, all while you’re panicking on the inside. There will be balls that come right up to the net, and playing them feels difficult and risky – and a million different options run through your head. Obviously, with good training and increased experience, you’ll learn to handle these situations, but middle blockers have to be ready to think on their feet. Literally. Take control of those chaotic plays at the net and be ready to go again if it doesn’t work the first time. Being a middle has been part of who I am for most of my life. Through playing and coaching volleyball, I’ve discovered that there’s much more to it than just learning to block and hit quick tempo sets. With enough practice, anyone can do that. But to be a truly great middle blocker, you have to adopt the mentality and make the attitude part of your game. Middle is one of the most complex and challenging positions volleyball. That’s what makes mastering it so fulfilling. Jaimee Rindy is a junior middle blocker at Coe College in Cedar Rapids, Iowa.